David Holdener provides a link to Revelstoke’s long history of skiing and brewing. There’s not many people who can say they’ve been skiing in Revelstoke for as long as David Holdener. When he first strapped on skis, there wasn’t even a rope tow in town. Instead, they would hike up the Hickory Run, which was across the railway tracks from where Save-On Foods is now, and then ski down. That was when Holdener was eight, when ski jumping was a big deal in Revelstoke and the idea of putting a ski resort on Mount Mackenzie hadn’t even been contemplated. Instead, the kids would race out after school, grab their skis and head either to the Hickory Run or the Big Bend ski jump. Because it got dark so early, they’d only have time for one or two runs or jumps. “All the young kids I knew skied,” Holdener told me. Holdener still skis. At 77, he’s one of the oldest season pass holders at Revelstoke Mountain Resort and he enjoys going up the mountain on weekends with his wife Roberta. Not only is he part of Revelstoke’s skiing history, he’s also closely tied to it’s brewing history. His family owned the town’s brewery, Enterprise Brewing, for close to 30 years and he worked there as a kid growing up, from when he was 11 to when the brewery shut down when he was 18. Yes, back in the 1950s minors could work in breweries. Enterprise Brewing opened in 1897 and David’s grandfather Xavier, an immigrant from Switzerland, purchased it in 1920, David said. It was a bustling business that, much like Mt. Begbie Brewery today, supplied the town and beyond. Xavier died in 1939 and David’s father Arnold and uncle Harold inherited the business. David started working there in 1950, making boxes, washing bottles, inspecting beers as they came off the line (usually for dirt, but sometimes mice), and boxing the bottles and loading them into trucks. He enjoyed his job and worked after school from 7–11 p.m. “Maybe that’s why I didn’t so good in school,” he said. Beer was cheap back then and, according to Holdener, people drank a lot. He says they would fill up 120 kegs every weekend for the King Edward hotel alone. They also handled bottling and local distribution for other breweries and soft drink companies. Sadly, the brewery was forced to close in 1957 when a union drive raised wages and made it unprofitable. 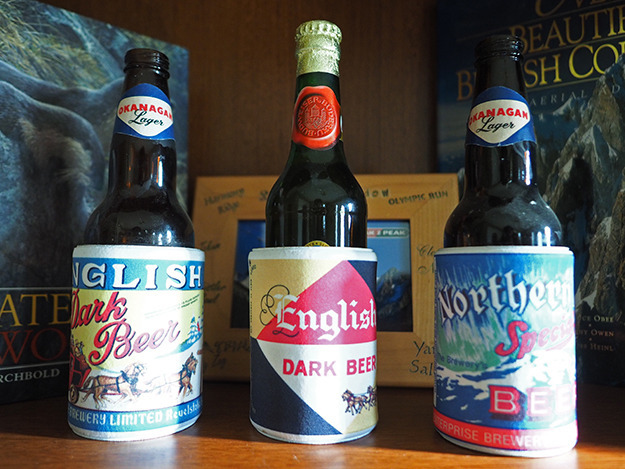 Photo: David Holdener still has a few of the Enterprise Brewing beer cozies at home. The distribution side of the business remained and they picked up contracts delivering beer for major breweries and Pepsi throughout town. They also got into collecting empties. In 1977, Holdener opened up what is now the bottle depot. It was the second business to go into the industrial park and it was both a collection facility and distribution warehouse. He ran it until a decade ago, when he sold it to Tony Scarcella and retired. Unlike many from his era, Holdener didn’t get married until he was 35, when he and Roberta got hitched. He waited because he enjoyed the free, partying lifestyle of his 20s. He worked six days a week at the family business, then spent Friday and Saturday evenings bartending. The beer didn’t stop flowing. Meanwhile, Holdener skied on Mount Revelstoke, either on the runs lower down or out of the Heather Lodge at the summit; and later on Mount Mackenzie. Holdener is a big supporter and promoter of Revelstoke. He has an active Twitter account and comments frequently on local affairs. He’s lived through the booms and busts and loves to hear newcomers talk about how much they love his hometown.